My little brother is the only person on earth I have ever punched as hard as I could. It’s been 35 years, but I can still recall the intense feelings of rage I felt toward him for his hideous way of… talking. Or chewing. Or maybe watching TV. But mostly for being cheerful while I wrestled with the misery of adolescence. Now I hardly ever punch him anymore, and not only because he’s eight inches taller and 60 pounds heavier than I. It turns out he’s one of the funniest, warmest, most charming people I’ve ever known, and his chewing is fine. There are few people on earth I’d rather spend time with. In my house, the two girls–seven years apart–almost never fight, and in fact exist in a near-constant state of mutual adoration. It’s their brother, not quite smack in the middle, who’s the linchpin, and just as capable of fighting up as down. He once pounded his big sister’s door with a hammer, in retaliation for her turning off the Wii, apparently mid-game. But mostly the two big ones just act like The Bickersons, arguing so protractedly over idiotic issues like whether a purple glass pitcher will explode in the microwave–and how many minutes it will take–that I feel like my head will explode. 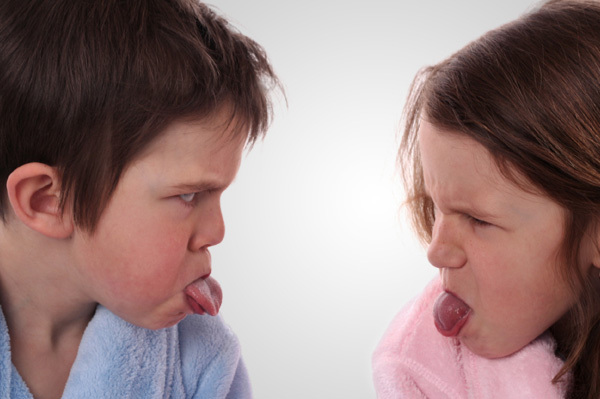 My son reserves most of his intolerance for his little sister, which is ironic since she is tough, athletic and game for anything–not the pink-loving, Barbie-playing crybaby he could have gotten. He gets irritated, among other things, by: her voice (it’s loud), her agility (she’s skilled at climbing door jambs), her friends (they’re loud), her choice in cartoons and her inability to memorize state capitals. 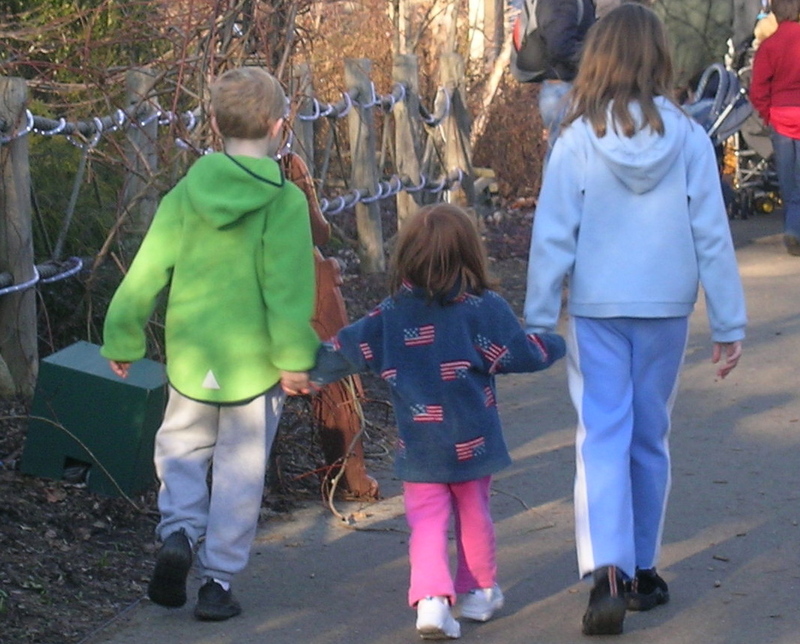 But mostly he is as annoyed by her unflagging exuberance as I was by my brother’s–only now that I’m the parent, it’s not nearly as acceptable. Usually I model my reaction on hers. When we were driving home after New Year’s break, she was sitting in the middle seat of the minivan and turned around to look for a DVD in the back seat, where her brother was sprawled with his laptop. “WHAT?” he sneered, glaring at her. “TURN AROUND.” She did, and I instantly saw the shocked, wounded look on her face, scrunched with the effort of containing tears. I wanted to crawl over the middle seat and throttle him. But if she’d had her usual reaction, which is to brush it off and ignore him, I probably wouldn’t have thought about it twice. Still, sometimes my heart breaks when hers doesn’t. 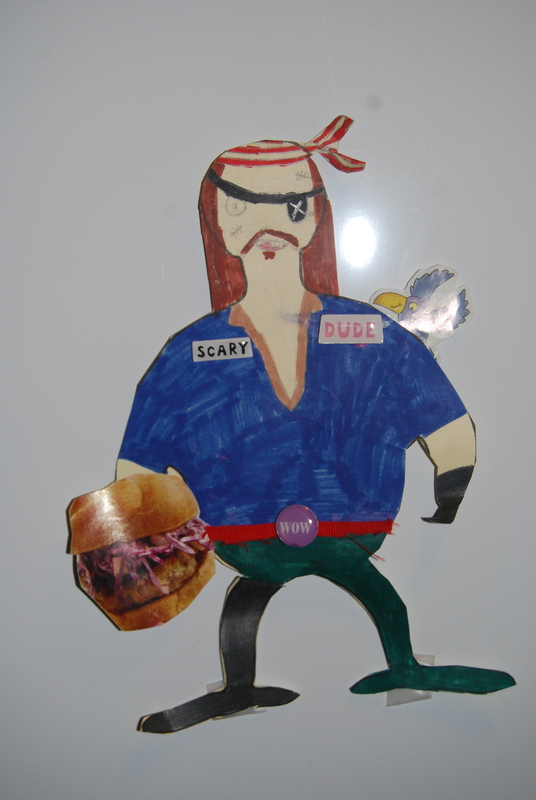 Around Thanksgiving, she was assigned the task of devising a costume for a paper turkey, and for some reason she decided it should be a pirate, and that her brother was just the one to help her. She asked him and he grudgingly agreed; then, as the deadline approached, she kept nudging him, and he kept putting it off. Finally, the night before it was due, she sat alone at the kitchen table, decorating the turkey pirate all by herself. I had tears in my eyes, but she was humming. You can’t make your kids be nice to each other. The best you can hope for is that they learn to adjust their expectations of one another, and then just ride it out. Even we are beginning to see signs of progress. The two big ones have started a nice tradition of going out to breakfast together on the weekends. My son, on occasion, has begun inviting his little sister to play “Call of Duty.” And if she hugs him between rounds of semi-automatic weapon fire, sometimes he even hugs her back. This entry was posted in Boys will be boys, Family life, Kids, Parenting, Teenagers and tagged sibling rivalry. Bookmark the permalink. I would have teared up at the solo pirate-turkey making too. Look at it this way, all of that teasing and taunting will make for great storytelling over holiday meals one day. I once tried to light my brother’s pajamas on fire, while he was in them! He still reminds me about it today. But, like you and yours, we good pals today. AWWWWWW!!! I teared up as I read this! I have the EXACT same feelings amongst L, S and E. I just can’t stand the meanness! Thanks for sharing. I will make sure my gals read this and say, “SEE?? ?” And they will give me the same blank stares and wonder why I am intruding. It all resonates …. So… True…! All so true, and so well-told. Thanks for the normalization! Love this. it is a topic near and dear to our hearts as we explored it earlier this year as well. You have done a beautiful job here.